Fort Loramie's Aleah Frilling chases down a bunt during a nonconference game against Bradford on Saturday in Versailles. Versialles' Taylor Hayes runs for third as Bradford's Ramse Smith fields a ground ball during a nonconference game on Saturday in Versailles. Versailles’ Salem Leach fouls off a pitch during a nonconference game against Bradford on Saturday in Versailles. Versailles' Breanna Nieport goes after a ground ball as Bradford's Ramse Smith runs for home during a nonconference game against Bradford on Saturday in Versailles. 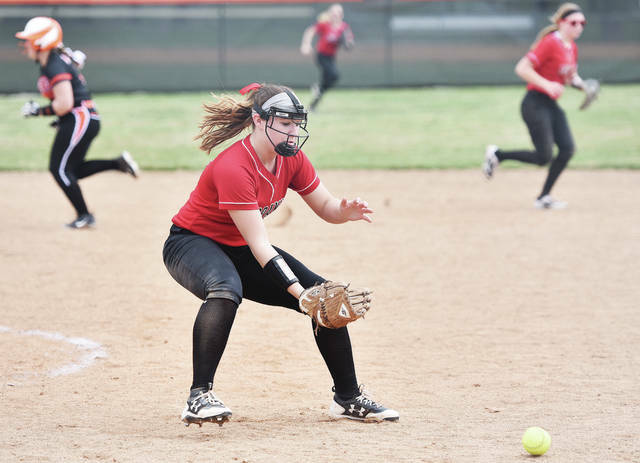 Fort Loramie's Ellie Holthaus chases a ground ball as Bradford's Bianca Keener runs towards second base during a nonconference game on Saturday in Versailles. Fort Loramie's Cassidy Albers waits for the ball as Bradford's Buzz Brewer heads for first during a nonconference game on Saturday in Versailles. Fort Loramie’s Macy Imwalle throws to home plate during a nonconference game against Bradford on Saturday in Versailles. 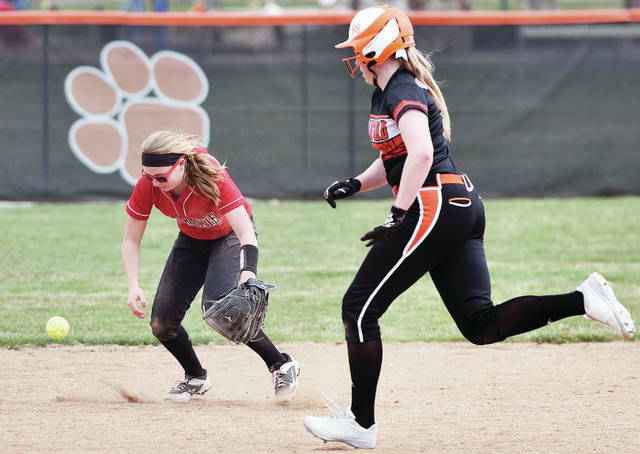 VERSAILLES — Fort Loramie opened up a tripleheader with Bradford and Versailles on Saturday by beating the Tigers 10-7. The Redskins had a 10-1 lead heading into the bottom of the sixth, but the Tigers scored one run in the inning and added five more in the seventh to narrow the final gap. Fort Loramie had 15 hits and five errors while Versailles had 10 hits and three errors. Aleah Frilling was 4 for 5 for the Redskins with 3 RBIs. She hit two doubles and had two stolen bases. Clara Gephart, Desiree’ Fogt, Macy Imwalle, Ellie Holthaus and Aubrey Baker each had two hits. Fogt and Imwalle had doubles and Baker hit a home run. Frilling picked up the win in the circle. She pitched seven innings and allowed four earned runs. She had 10 strikeouts and five walks. Lauren Monnin was charged with the loss for Versailles. She pitched seven innings and allowed eight earned runs. 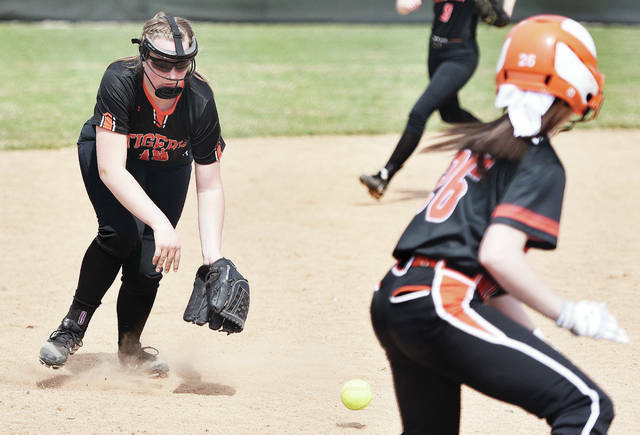 Hannah Barga, Faith Huddle and Caitlyn Luthman each had two hits for the Tigers. Barga and Huddle hit doubles, Luthman hit a triple and Monnin hit a home run. The Redskins lost the second game of a tripleheader on Saturday in Versailles. The Railroaders had 18 hits and three errors while Fort Loramie had eight hits and three errors. Desiree’ Fogt was 2 for 2 with one walk while Cassidy Albers was 2 for 2. Fogt had a double, as did Clara Gephart and Jasi Piatt. Aleah Frilling was charged with the loss. She pitched 2 1/3 innings and allowed 10 earned runs on 13 hits. No information was reported on the third game of Saturday’s tripleheader in Versailles. Sidney couldn’t complete a rally in the first game of a home doubleheader with the Bulldogs on Saturday. The Yellow Jackets scored five runs in the seventh to narrow the final gap. Lauren Barker was charged with the loss. She had six strikeouts and one walk in seven innings. Alli Milanese was 3 for 4 with 3 RBIs for the Yellow Jackets. Destiny Harris, Allie Herrick and Hallie Westerbeck each had two hits for Sidney. Madison Osborne led the team by scoring three runs. The Bulldogs pulled away in the second game of a doubleheader on Saturday in Sidney by scoring five runs in the third inning to take an 8-1 lead. All Milanese picked up the loss in the circle for Sidney. Lauren Barker was 3 for 4 at the plate for the Yellow Jackets. She hit a triple and had one stolen base. Hallie Westerbeck and Heidi Aselage each had two hits. The Cardinals scored two runs in the first inning and put the game away with two more in the fourth to earn a win in the first game of a doubleheader on Saturday in New Bremen. New Bremen had nine hits and no errors while Anna had eight hits and no errors. Marissa Topp was 2 for 4 with 2 RBIs for the Cardinals and had a double. Kelly Naylor was 2 for 3 with two runs and had a double. Kira Bertke and Molly Smith also both had doubles. Smith picked up the win in the circle. She pitched a complete game and gave up one earned runs. She had four strikeouts and one walk. Elaina Crosson was charged with the loss for Anna. She allowed five earned runs in six innings and had four strikeouts with two walks. Nylah Crosson was 3 for 3 at the plate for the Rockets while Brandi Weber was 2 for 2. Taylor Spence had a triple. 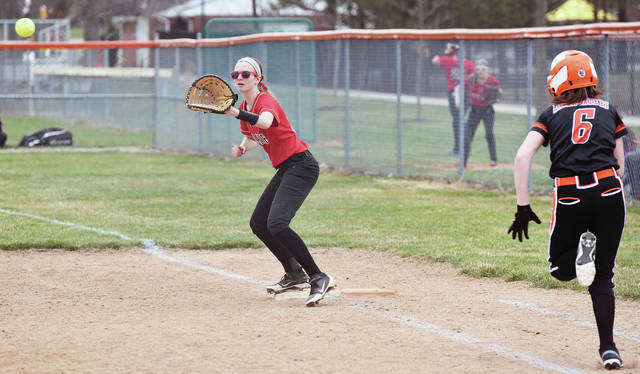 The Cardinals scored nine runs in the first two innings and ran away to a run-rule win in five innings in the second game of a doubleheader on Saturday in New Bremen. 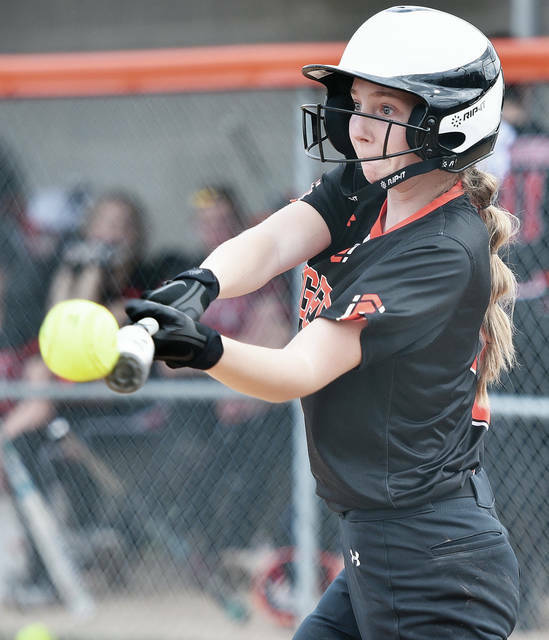 New Bremen had seven hits and one error while Anna had four hits and three errors. Hannah Tenkman was 2 for 3 with 1 RBI and two runs for the Cardinals. Ashton Heitkamp doubled and Marissa Topp tripled. Sarah Parker earned the win in the circle. She allowed one earned run on three hits in 4 1/3 innings and had one strikeout. Olivia Place was 2 for 2 for Anna. She had two doubles and Taylor Spence had one. The Jets scored nine runs in the top of the seventh inning to complete a rally in the first game of a road doubleheader on Saturday. The Jets had 11 hits and four errors while the Blackhawks had eight hits and two errors. Brittany Strunk was 2 for 4 with 3 RBIs for the Jets. Both her hits were doubles. Lauren Dudgeon and Katie McKenzie were both 2 for 4 with 1 RBI and Skylar Jones was 2 for 3 with three runs. Allison Roush earned the win in the circle. She pitched a complete game and gave up three earned runs. She struck out eight batters and gave up four walks. The Jets earned a run-rule win in five innings to complete a sweep in a road doubleheader on Saturday. Fairlawn had 12 hits and one error while Mississinawa Valley had three hits and three errors. Ashley Roush was 2 for 3 with two runs for Fairlawn while Madison Pierce was 2 for 3 with three runs. Lauren Dudgeon was 3 for 4 with 4 RBIs and two runs and Skylar Jones was 2 for 4. Renee Gent had a triple while Dudgeon had two doubles and Pierce and Allison Roush each had one double. Jones picked up the win. She allowed one earned run in five innings and had five strikeouts with two walks. The Raiders scored eight runs in the fourth inning to take a lead but the Buccaneers added two in the bottom half and six more in the fifth to rally and earn a win in a nonconference game on Saturday in Covington. Russia had five hits and one error while Covington had eight hits and four errors. Jenna Cordonnier was 2 for 3 with two runs and 2 RBIs for Russia while Riley Hammonds was 2 for 2 with 1 RBI and one run. Hammonds had a double. Morgan Wenrick was charged with the loss. She allowed seven earned runs in six innings. The Pirates lost the first game of a home tripleheader on Saturday with Northwestern and Miami East. Northwestern had 11 hits and three errors while Riverside had five hits and three errors. Sierra Snow and Jalynn Stanley were both 2 for 3 for the Pirates. Snow and Shelby Giles each had a double. Giles was charged with the loss. She allowed two earned runs in four innings on seven hits and four hit batters. She had five strikeouts. The Pirates closed out a home tripleheader with a win over Miami East on Saturday. Riverside had 11 hits and four errors while Miami East had eight hits and two errors. Shelby Giles was 2 for 3 with 2 RBIs while Courtnie Smith was 3 for 3 with 3 RBIs and Leah Kelsey was 2 for 4 with 2 RBIs. All three each had one double. Giles earned the win. She pitched a complete game and allowed three earned runs on five hits and two walks. She had five strikeouts. Botkins lost 12-1 and 11-1 in a doubleheader on Saturday in Ansonia. Lehman Catholic finished third at the MVTCA C Flight Cup Saturday. “It was a good tournament for our team against some traditional Miami Valley tennis powers,” Lehman coach Tim Ungericht said. Danny Lins finished third at first singles. He defeated Valley View 8-2, lost to Alter 8-3 and lost to Fairmont 8-3. Sam Gilardi received a silver medal for finishing runner-up at second singles. He defeated Alter 8-1, Fairmont 8-4 and lost to Valley View 9-7. Max Schmiesing finished third at third singles. He lost to Fairmont 8-6, defeated Valley View 8-6 and lost to Alter 8-6. Elias Bezy and Elijah Jock finished third at first doubles. They defeated Valley View 8-0, lost to Alter 8-5 and lost to Fairmont 8-1. Sean Toner and Cole Kramer received silver medals for finishing runner-up at second doubles. They defeated Alter 8-0, lost to Fairmont 9-8 (6) and defeated Valley View 8-0. Fort Loramie’s Aleah Frilling chases down a bunt during a nonconference game against Bradford on Saturday in Versailles. Versialles’ Taylor Hayes runs for third as Bradford’s Ramse Smith fields a ground ball during a nonconference game on Saturday in Versailles. 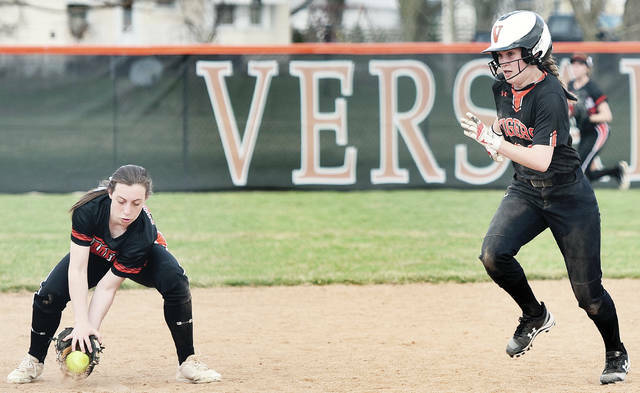 Versailles’ Breanna Nieport goes after a ground ball as Bradford’s Ramse Smith runs for home during a nonconference game against Bradford on Saturday in Versailles. 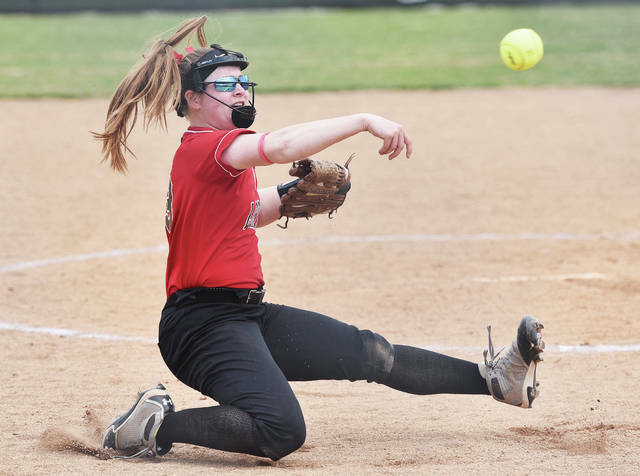 Fort Loramie’s Ellie Holthaus chases a ground ball as Bradford’s Bianca Keener runs towards second base during a nonconference game on Saturday in Versailles. Fort Loramie’s Cassidy Albers waits for the ball as Bradford’s Buzz Brewer heads for first during a nonconference game on Saturday in Versailles.